"The camera is a weapon against the tragedy of things, against their disappearing." Some things are surprisingly resistant to change. Despite the myriad pressures involved, the built environment remains stubbornly so. Patrick Keiller's The City of The Future drew on footage from the first decade of cinema (1895-1905), with the curious insight that many British cities are very recognisable from how they appeared around the turn of the twentieth century. Visionary architects of the modernist avant garde always presented the city of the future as erupting, fully formed, from a tabula rasa. However, many of the fleeting figures from the film footage that Keiller curated would easily recognise those same streets in London, Liverpool, and the other cities one hundred years on: much of the late Victorian and Edwardian infrastructure continues to shape life in the cities today. Keiller also touched on similar themes in the rarely-seen The Dilapidated Dwelling, a film commissioned, but not shown by Channel 4, due, Keiller believes, to its pessimistic tone around the inability of the domestic house to become innovative through the vested interests of capital. Keiller's central premise is that technological advances in design, manufacturing and automation, have been painfully slow at affecting house building - especially in Britain - when these have transformed so many other spheres of life in the material world. Patrick Keiller uses a statistic that, at the current rate of replacement, buildings in Britain will have to last an average of five thousand years. Forty years is a trivial length of time in comparison, yet in terms of the felt experiences of material existence in the developed world, it is: the texture of everyday life from the 1970s was very different. 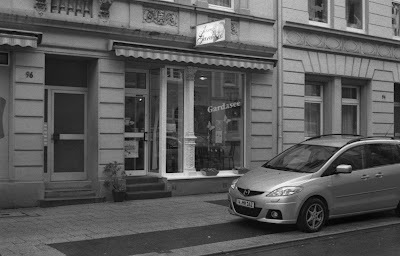 Researching the trip to Wuppertal, I looked for the locations using various maps online - and also Google StreetView. This appeared to show a cafe that displayed such strongly consistent architectural features that it must be the one used in Alice in the Cities. This seemed remarkable in a way that the continuing function of the Schwebebahn does not, for example, or the continuing needs that the road network serves. On the opposite side of the road there is a neon sign "Seit 1907" which also remains. On Sunday morning, I visited the Eis-Cafe Gardasee. Alighting at Sonnborner Strasse, I was pleased to find it open on an otherwise quiet street. I was the only customer. 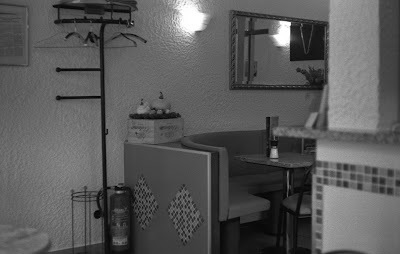 The interior decor has changed, hardly a surprise, and the jukebox has gone (one would imagine that the jukebox was originally part of the cafe's furniture, not set dressing for the film). I ordered a glass of tea (the unceasing rain meant an ice cream seemed less apt), and sat in the window, at a table in the same position as Alice and Philip do in the film. 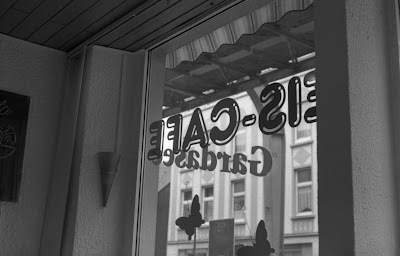 Although the proprietor did not speak much English, my German was sufficient to ask if she knew Alice in the Cities. She smiled at this and said that she did. When she brought the tea to my table, she saw the stills that I had taken from the DVD for reference. This opened up more conversation. 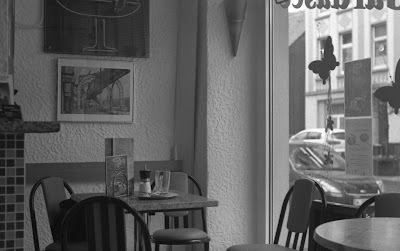 She was fascinated to see the image of the cafe from the outside, and the presence of the roadworks caused used some comment, although I could not entirely follow what she said. She did not look too much older than me, and I did not get a sense of whether she had been around when the film was made, but she cannot have been any older than Alice, if that. She said something about Wim Wenders returning to Wuppertal after thirty years to make Pina. As the conversation seemed to be faltering, or entering a natural break at that point, I asked the woman her name. Smiling, she said it was "Pina", before pausing to say, "Josepina". She left me to my tea, but I could hear her talking to the chef in the kitchen - I was referred to by the kind if not entirely accurate epithet "young man" - and the chef came out to meet me. He wanted to see the stills, and was quite talkative; I only caught the general gist of what he said, and he had less English than Pina, but he did point out the photograph on the wall behind me- of the Schwebebahn above Sonnborner Strasse in the 1970s. Wim Wenders has explained his motivations as a film maker in a number of writings and interviews which contain sentiments along broadly similar themes as the quote that begins this post (another is: "Things are disappearing; if you want to see them you have to be quick"). This is undoubtedly true for many aspects of everyday life, but the past can be tenaciously persistent in its ability to exist in a continuity with the present.